Earlier this year I acquired the Barbarossa Custom Creations Laser Light Skeletor. I had become somewhat obsessed with the figure, and it was my best shot at getting a complete, working and nice-looking example of the rare, European release figure at a price that wouldn’t require the sale of an internal organ. 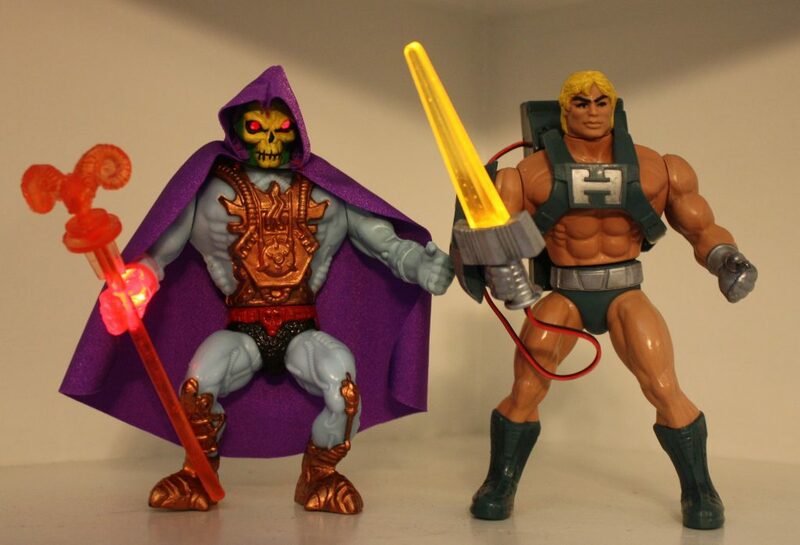 At the time I was only planning on getting the one figure, but I was so impressed with it, I had get Laser Light Skeletor’s heroic counterpart, Laser Power He-Man. 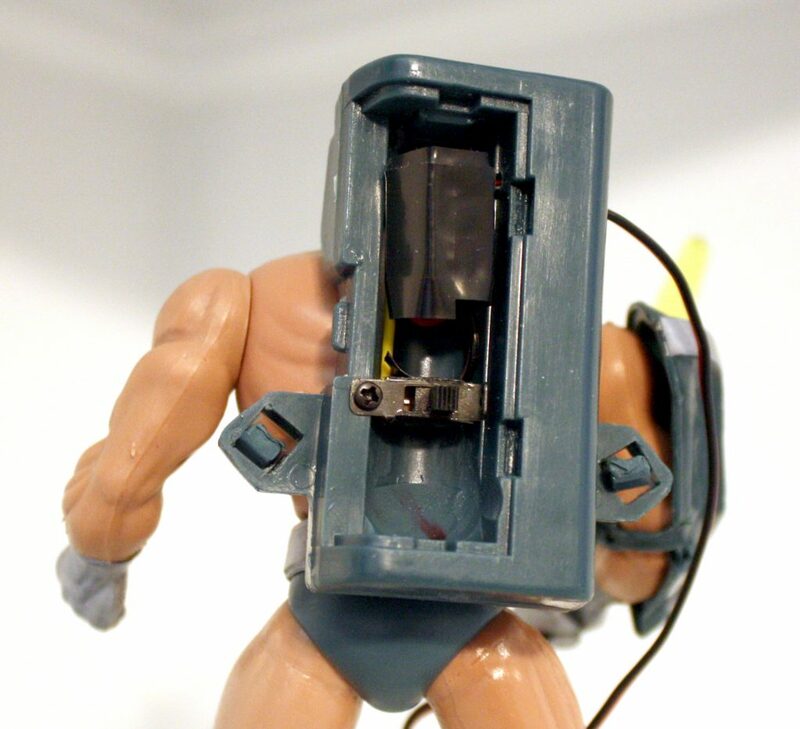 If you’ve ever purchased a custom or replica action figure from any customizer/builder, you know they’re not cheap. That’s just a factor of economies of scale. It’s considerably more difficult for one person to create one figure at a time than it is for a fully equipped factory (with steel molds, paint masks, etc.) to pump out one figure among tens of thousands. 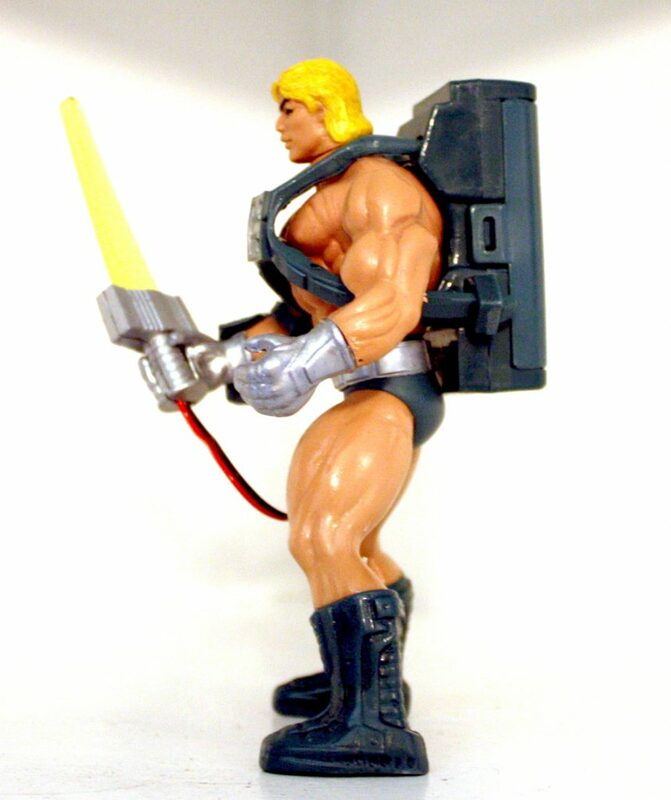 It’s even more difficult with a complex toy like Laser Power He-Man, with his internal electronics. 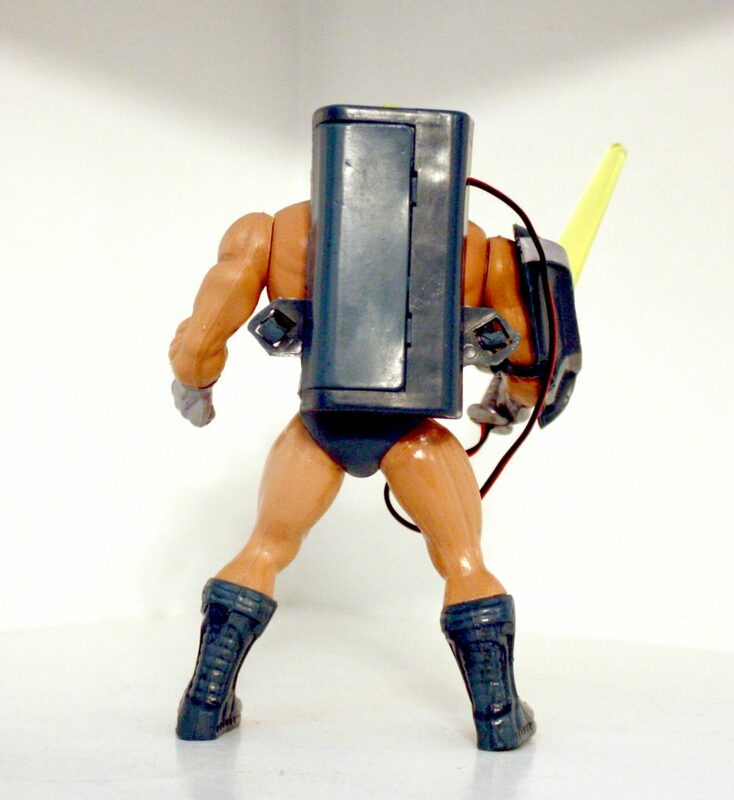 But as the original laser figures were produced in low numbers and only released oversees, they go for quite a lot of money on the secondary market. In this case, the replica is something like a third of the cost of the original. Barbarossa offers the figure in both of its vintage configurations – with either the unique head sculpt that came with the Italian version of the figure, or the 1982 style head which came with the Spanish version of the figure. The Italian version is often called the “Dolph” head for its resemblance to Dolph Lundgren. 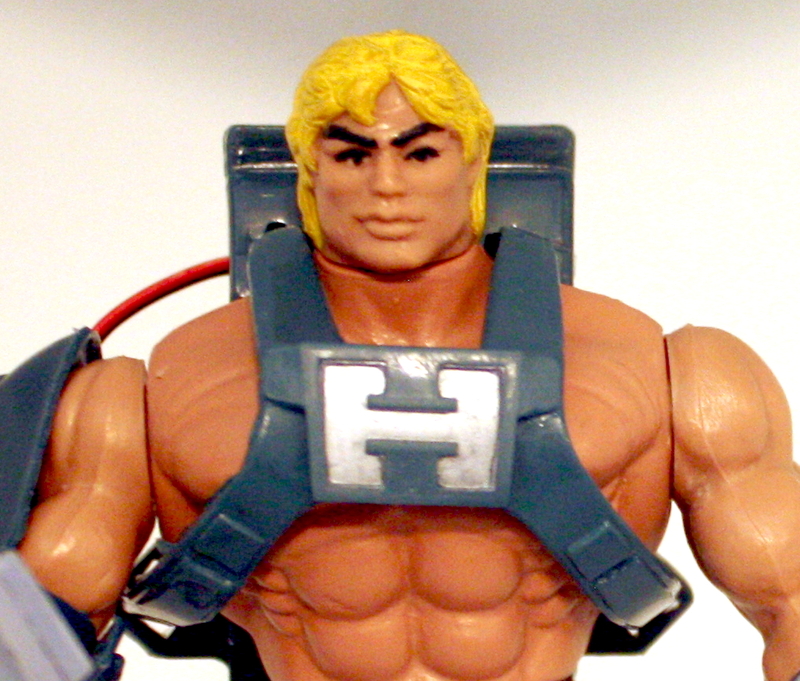 In my opinion, no He-Man head sculpt will ever surpass the original 1982 version. 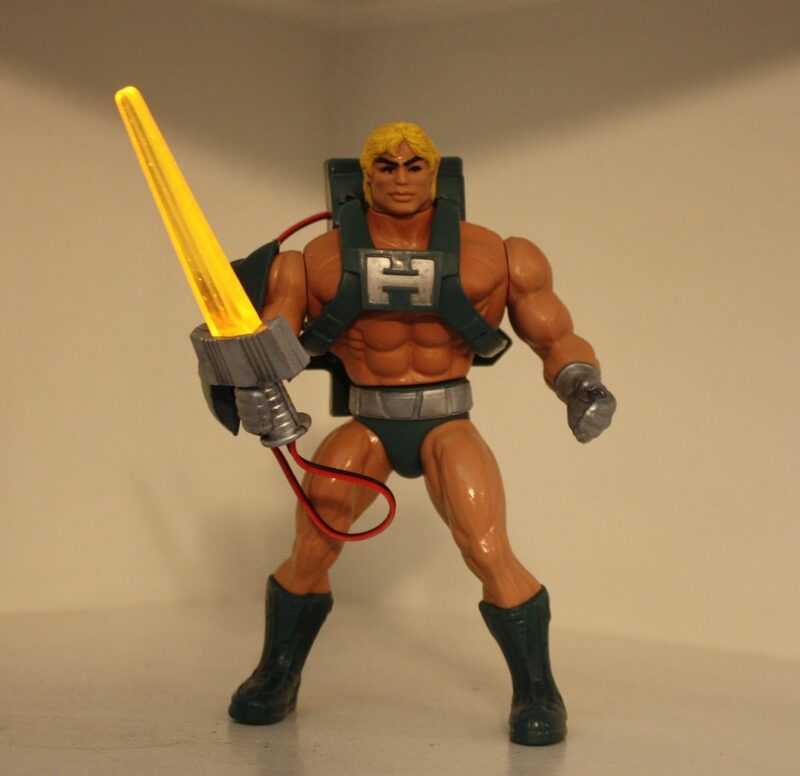 However, I opted for the Italian “Dolph” version, as this was my one chance to get a figure with that particular head, and I’ve already got the original head on my other vintage He-Man figures. Barbarossa has actually done something really interesting with this figure that adds to its durability. Rather than casting the figure in one or two colors and painting in the details (as was done in the vintage figure), Barbarossa casts the trunks and boots in the same teal as the armor. The belt and gloves are cast separately in silver. These pieces are glued together for a seamless look, and the there is no possibility of paint wear on the gloves or boots (an issue that plagues many vintage figures). The only painted parts, in fact, are the head (hair, eyebrows, and eyes) and the silver accents on the armor. The figure retains all of his vintage points of articulation. Another modification is that the belt lacks the “M” design of the original. The plastic has a very realistic feel to it. I don’t know what the secret formula Barbarossa uses for his materials, but it feels very much like a factory figure. The cast is nice and crisp, with better paint details than many factory examples. The figure also stands solidly without a tendency to fall over. The light up action feature has been altered from the 1988 original. 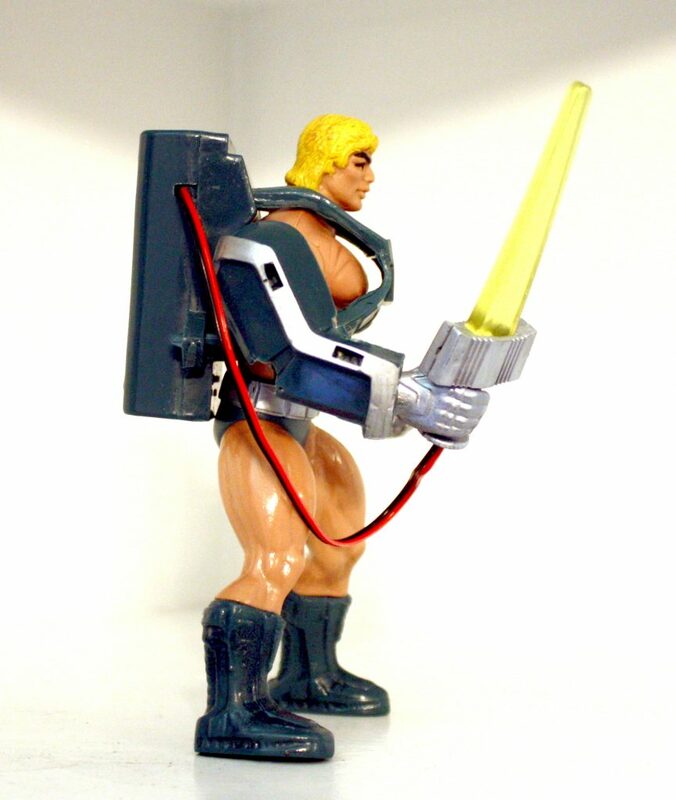 Instead of raising his arm to activate the sword, the light turns on with a switch hidden in the battery compartment. The light runs on a watch cell battery, rather than an AA battery as the original did. If you happen to have a vintage LP He-Man without his accessories, Barbarossa also sells them separately for a reduced cost. The sword glows quite brightly, especially in the dark. 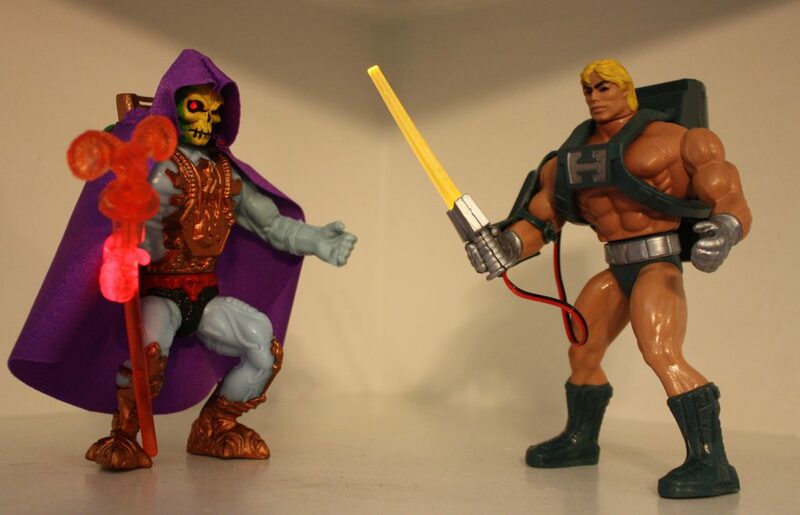 I took some shots with him next to the modern Masters of the Universe Classics Laser Power He-Man for comparison. Left to right: 1992 Thunder Punch He-Man, 1990 Battle Punch He-Man, 1989 “New Adventures” He-Man, Barbarossa Laser Power He-Man. 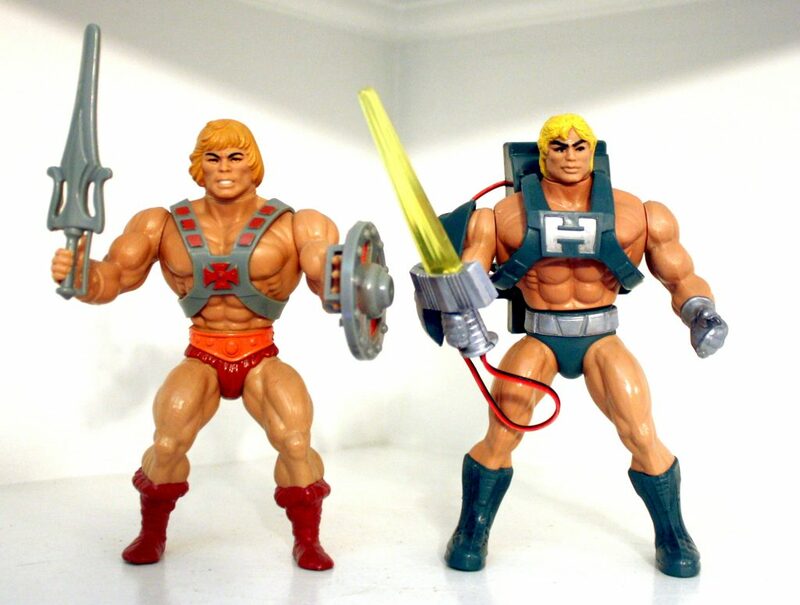 You can see in the photos above that a big theme in Mattel’s sci-fi themed He-Man figures is translucent yellow swords. My understanding is that all of the above figures were designed by Martin Arriola, with the exception of Battle Punch He-Man, who originates from a design by Mark Taylor. 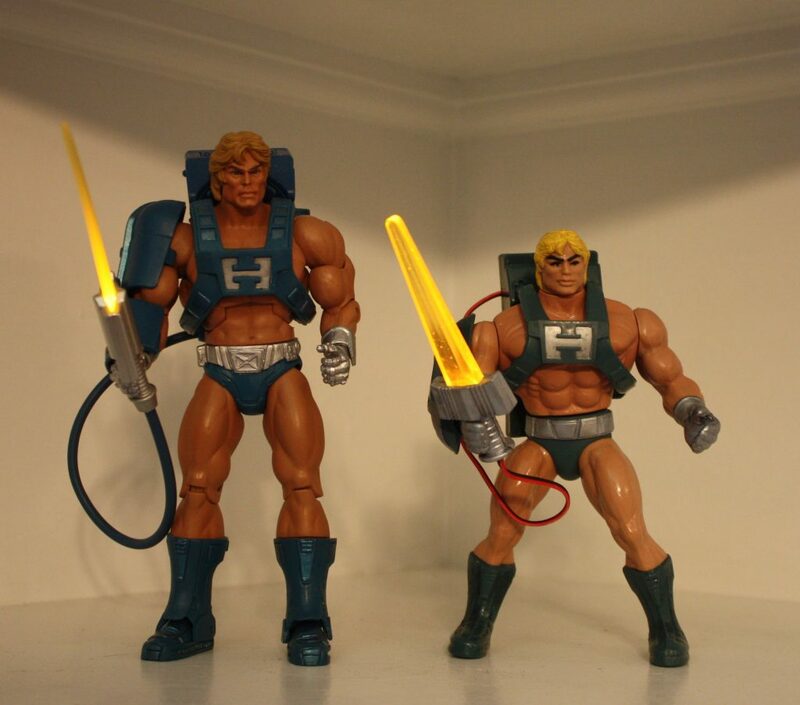 Laser Power He-Man, to me, is much more recognizable as a He-Man figure than any of the New Adventures versions. I suspect if the rebooted line had been more in the style of the Laser figures, they might have had greater success. 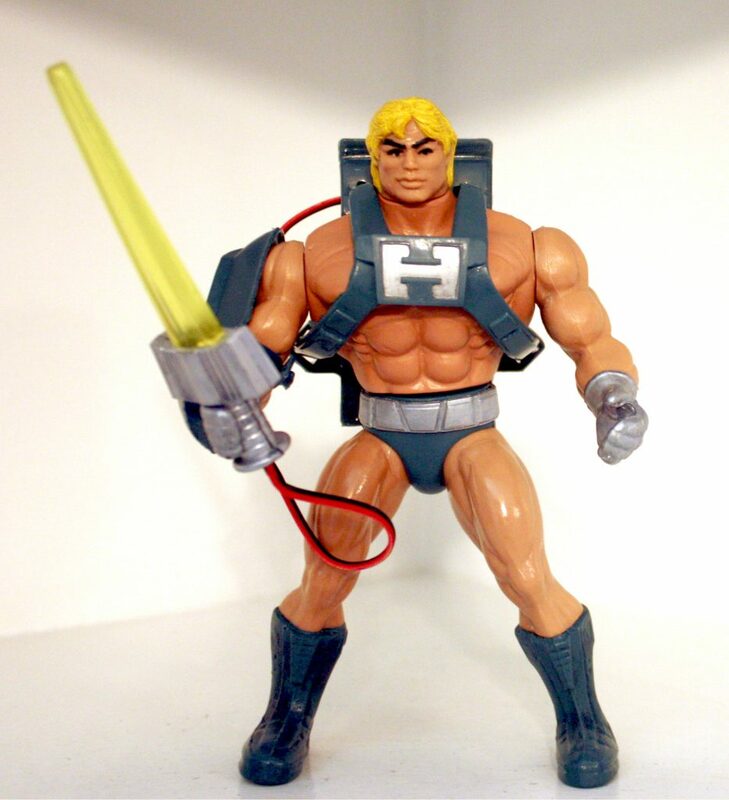 I’ll explore the history of Laser Power He-Man in more depth in a future toy feature. In any case, I’ve been thoroughly pleased with Barbarossa’s customs so far, and would recommend his Laser figure replicas to anyone looking to add these hard to find figures to their collection. I’ve picked up his customes here and there. Superb work!